Jeronimo F. Lozano is an artist whose speciality is creating retablos, an ancient Incan and colonial Spanish folk art tradition. The art form is a series of pictorial scenes arranged in a single work to relate a mythical or historical drama. The scenes consist of handmade figurines. 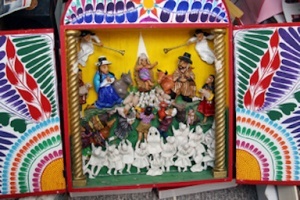 The scenes can be made in wooden chests, gourds, seashells, tree trunks, reeds, eggshells, or matchboxes. They were originally portable altar boxes carried by travelers for protection. He was born and raised in the mountainous Ayacucho region of Peru, and as an artistic child, he was selected to attend various colegios that specialized in art training. 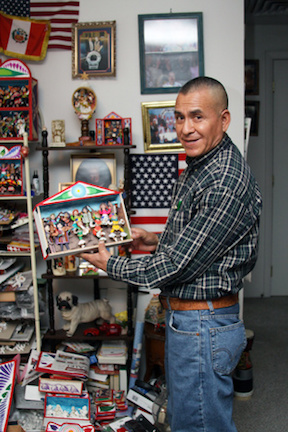 When he was about 8 years old, someone asked him to repair an old retablo. He experimented until he figured out how to make the repairs and was paid with a baby lamb. By the age of 16, he was selling his retablos in tourist shops and had an art exhibit in Lima. He attended the School of Fine Arts at the University of Peru. From 1967 to 1979 he traveled throughout Peru and studied with the traditional folk artisans in the Andes Mountains. In 1979 he founded the Artists Workshop Guamangensis. The Peruvian government asked him to travel with a group of folklore artists to the United States in 1994. With the rise of terrorism in his home region, he stayed in the US to exhibit his work and lived with a family in Salt Lake City and was soon baptized a member of The Church of Jesus Christ of Latter-day Saints. The first model he made when he moved to Utah was of Joseph Smith and the First Vision. Lozano has taught his art through the Utah Arts Council. In 2004 he received the Utah Governor’s Folk Art Award. In 2008 he was honored with a National Heritage Fellowship. This page was last edited on 28 October 2016, at 23:50.